In case you haven’t heard, T-Mobile announced the world’s first — and for the time being, only — cell phone powered by Google’s open-source, mobile operating system today amid much pomp and circumstance. You can spend hours thumbing through your bookmarks or RSS feeds looking for and reading about the new T-Mobile/Google phone, dubbed the G1. Most everybody is writing about the same thing — the specs, the looks, the apps, the Android operating system. But there are a few posts out there looking at the G1 from various other perspectives — advertising, search, what’s missing, and so on. To save you a few minutes, we’ve combed through the basics, looked under the hood just a bit, hit on the basic apps, and compiled other posts of interest for your reading pleasure. The G1 will be available Oct. 22 for $179 ($20 less than the iPhone) with a two-year contract (same as the iPhone). Unlimited data is $25/month or $35/month with unlimited messaging. A voice plan is required. T-Mobile will likely have the Google phone exclusively for a few months, then other carriers and manufacturers (Motorola, Samsung, LG and one mystery phone maker) are expected to debut their plans/phones in early 2009. 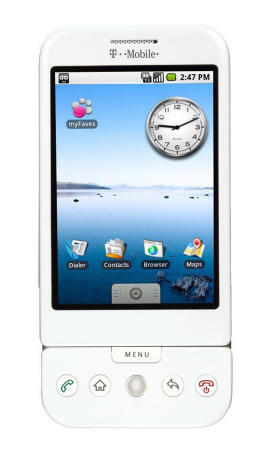 The phone will be available in the UK in November and much of the rest of the world in early 2009. For more info check out Sarah Perez’s post for ReadWriteWeb. It was manufactured for T-Mobile by HTC. 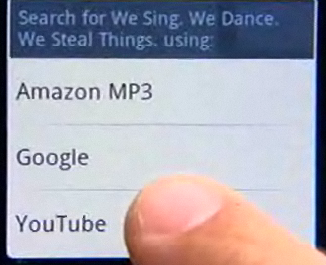 Google offers a video explaining its Gmail, contacts, Calendar, and GTalk applications. Lots of pretty pictures from CNET News, if you like seeing a bunch of dudes standing around holding cell phones. Naturally, there’s always a naysayer in the crowd. Crave tells us what we didn’t get with the G1. A fairly in-depth look at the software inside the G1 from CNET. The Wall Street Journal’s and New York Times’ (and here) takes on the G1 because, after all, they are the papers of record. TechCrunch is sorta the blog of record. Coverage from Engadget and Gizmodo, the gadget blogs of record. And Boing Boing is kinda the pop culture blog of record (but what does Cory Doctorow think?). Uncle Walt Mossberg of the WSJ gives his first impressions, but where is David Pogue of the NYT? And no coverage would be complete without GigaOM, although this post is Om-less. Forbes (basic coverage) is already calling winners and losers with the introduction of the G1, but as far as we can tell they’ve yet to call the 2008 U.S. presidential election. Forbes also brings us perspective from other open source projects, the LiMo Foundation and Mozilla. TechDirt, naturally, digs up the dirt on the T-Mobile G1 plan, citing a 1 GB per month data limit (via Broadband Reports). Guess it pays to read the fine print, especially when dealing with shifty wireless carriers. Leave it up to the Apple blogs (one being the AppleInsider) to reinforce the fact that Apple has a year-plus head start on Google and that the G1 will have little impact on the iPhone initially. We’ll see about that. Macworld, however, provides a nice FAQ to answer all your G1 questions. last100 editor Steve O’Hear also notes that the Gphone and Android will fuel the social web. 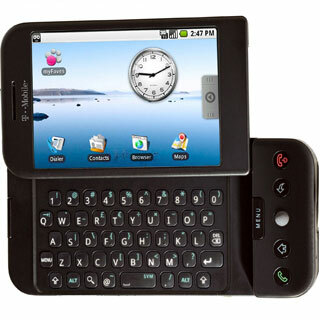 No question the G1, with the iPhone, are the Facebookers, MySpacers, and Twitterers phones of choice. I’m wondering what the GPS functionality is like? Is it closer to a full GPS, or still hobbled like Apple’s?